Being prepared on the field means getting the right turkey hunting gear. If you’re a newbie, you’ll need to do a bit more research on the matter. But even experts may find themselves lacking ideas and searching for new items to make their hunt more efficient. 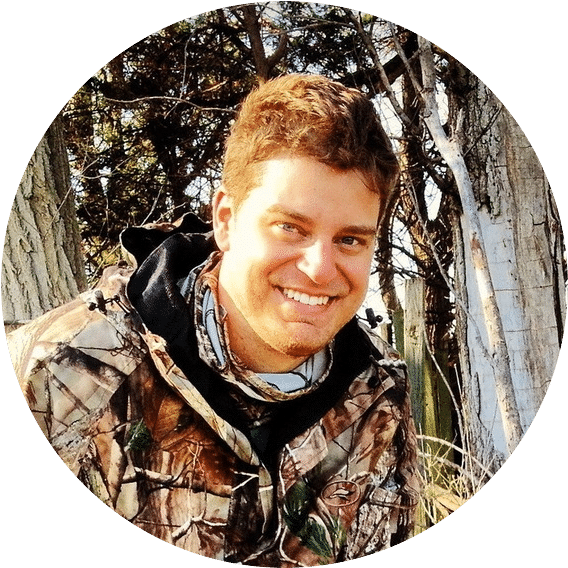 With all the technological advances and our increasing knowledge regarding wildlife, it’s no wonder so many cool gadgets are constantly being invented or perfected. So stick with us, we’ll tell you all about how to choose your gear and what items really stand up from the crowd. Make sure you get something affordable, yet effective for that particular price range. Many times, it’s wiser to invest in a cool gadget with a lot of features, but other times you can get your job done with the basic features that account for a low retail price. Just put quality and durability above everything else, and you’ll increase your chances of making a good investment. A reliable weapon you actually know how to shoot. Callers that make it easier to lure in wild turkeys by mimicking the noises they make. Decoys that look very realistic and improve your chances of catching your game. A blinder that can camouflage you on the field, so you can stalk the quarry without them noticing you. Ensure that you’re camouflaged both from a visual and an odor standpoint. Clothes that fit you well, are comfortable and insulating. A sturdy pair of boots that won’t let you down when you have to stand for a longer time or walk longer distances. A vest with a lot of pockets to carry the equipment you most need quick access to. A chair you can comfortably sit on during your turkey hunt. A sturdy backpack that helps you carry all of your equipment. Binoculars to help you spot your game easily. After taking into account all these factors and ideas, you can browse our selection of items with more confidence seeing as you’re armed with the right knowledge to make an informed decision. 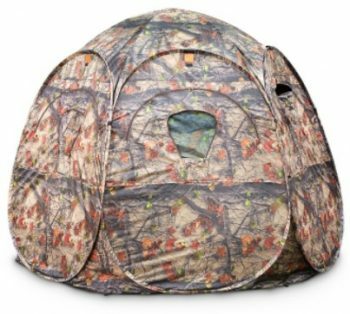 Description: This 3.8 stars and $54.99 Guide Gear 360 Degree Swivel Hunting Blind Chair is one item you definitely need when you’re out hunting for turkeys. That’s because you’ll benefit from something sturdy to sit on during your actual hunt, or even after it when you relax. The two main positives brought on by this chair are comfort and stability. That’s because the chair is made from grade A materials, that offer it an ergonomic feel. Besides, you can even shoot confidently while sitting down, in any direction without ever losing your balance. Its increased stability comes courtesy of its wide feet, that assist with balance even on soft ground. You will remain stealth at all times, even if you move around a lot because the good materials and the quality craftsmanship make this chair extremely silent. So you’ll get a 360° swivel, which is amazing for any rapid movements you might need to make. But the chair is also very stable, considering its frame is manufactured from heavy-duty steel. That, along with the dura mesh fabric, will help the chair support weights up to 300 pounds. Not to mention that both these materials are resistant, yet light, accounting for this item’s total weight of just 14 pounds. Consequently, this is one easy to carry a piece of equipment, considering its decent weight and compact dimensions. And if you fold it, the chair can become even less voluminous. Since it has a carry strap, you’ll be able to transport it easily too. Description: This perfect 5 stars and $99.99 Guide Gear Super Magnum 6-Panel Spring Steel Hunting Blind is definitely something that will keep you stealthy, hidden away from the turkeys that might spot you. Its first benefit is that it can be set up fairly easily. Even if it comes in a small, compact package of just a few inches, its spring frame allows it to pop up into a capacious shelter that can accommodate between two to four people. Of course, how much room you have inside depends on you too, considering the fact that some hunters may bring along more gear. Another great advantage is that it’s a weather-resistant blind, meaning you can confidently use it no matter the weather. It’s a perfect shelter for the spring when it might rain, get a bit windy or even chilly at times, but this blind will keep you securely insulated inside. You’ll not only be protected from the weather, but you’ll be fully camouflaged too. The fabrics from which this blind is manufactured ensure that no scent of yours will pass through its walls, rendering it perfectly contained from a scent viewpoint. Your movements inside will also be hidden thanks to its black interior, and the blind itself is less likely to be spotted thanks to its camouflage pattern. The six panels enable you to shoot from all possible directions, and the windows are zippered for increased protection. The shooting ports are screened, and you can use them with your weapon of choice, either a gun or a bow. The big door will give you quick access in or out, but will also keep you protected from the nasty weather. 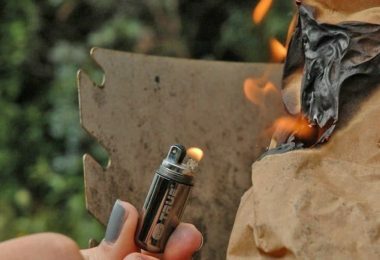 The materials used are top notch: the shell is made from strong polyester, for improved insulation and protection from fire. The interior is made from dark polyurethane to get rid of any shadows that might form, and the frame is made from magnum steel, which explains its durability. Description: This 4.4 stars and $25.49 Cass Creek Ergo Electronic Turkey Call is a real asset on the field if you want to increase your chances of getting your hands on a turkey. That’s because it includes five calls to use according to your needs, all having been recorded live. 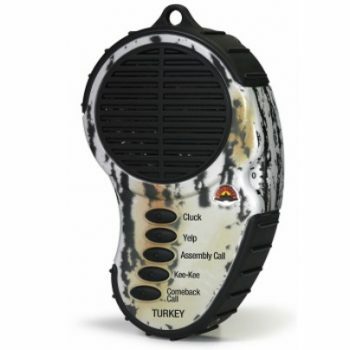 The authentic calls make this piece of gear highly efficient since it sounds very realistic to the turkeys. You’ll be able to use the clucking sound, which has a lower volume and it’s the primary means of communication between these birds when they want to find out each other’s position. The yelp vocalization is a bit higher in volume, and it signals a turkey in distress, while the kee-kee is a sound generally made by a lost turkey. The assembly call has been recorded from a hen that calls its peers and clutch, helping the gang come together, while the purr also reunites the hatch since it shows there’s lots of food around. All these vocalizations are included on this electronic caller, that’s handheld. You’ll have one free hand for using your gun or binoculars, but the other has to activate this gadget. No worries, though, because its use is fairly simple, you just have to push one button. Besides, the caller itself is compact and light and the materials used make it fairly ergonomic. The recordings are high-quality, they don’t sound tinny or fake even when conveyed through the external jack, and you also have additional features that make this caller more efficient. One is the possibility to automatically interrupt, and the other is the easily-reachable volume dial. Its operation is fast with just three AAA batteries, which are included along with a sturdy belt clip for increased portability. 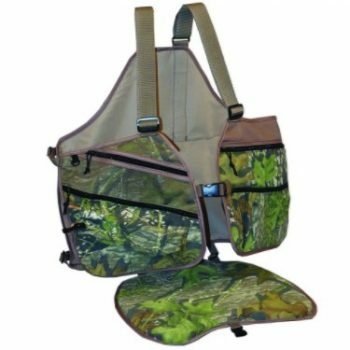 Description: This $49.99 Beard Buster Fan Men’s Turkey Hunting Vest is something most turkey hunters can benefit from on the field. That’s because most hunters carry a lot of gear with them that needs to be kept on hand, not in a backpack. Basically, you need something light, with a lot of pockets, that’s also pretty versatile and can keep you warm. So why not a vest? Considering its decent price, you can see how this is a good choice. The advantages it brings start with the ability to carry a lot of necessary stuff. You’ll need to have easy access to a caller so you can lure turkeys in, or even your slates and striker. 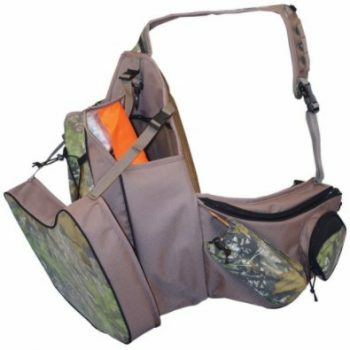 Of course, you can use this compartment for anything else you may need, but some of its pockets were specifically designed for stuff like a decoy – this even has an orange safety flag you can easily pull out. Other things you’ll need on your turkey hunt are a head net and gloves, and you’ve got pockets for those too! This cool, lightweight vest is manufactured from top-notch materials, meaning it’s waterproof and provides great insulation, so it can keep you warm on your hunt too. But its materials are also breathable, so you won’t sweat and lose body heat. Plus, it doesn’t matter what your size is since this vest can be adjusted to fit it. And the thing we love most? 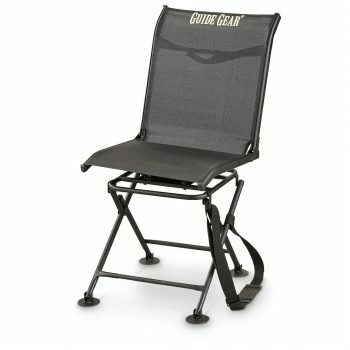 It has a waterproof cushion seat that’s 1-inch thick for when you feel like taking a rest. Description: This 4 stars and $62.21 Beard Buster Sling Shot Pack is another good, handy piece of equipment in which to carry the essential tools for turkey hunting. At 2 pounds heavy, it’s actually a pretty light vest, and since it has a mono strap construction, you’ll find it’s pretty mobile too. This single strap will go across your chest area, meaning you’ll be well ventilated, although the back of this vest will prove pretty warm. 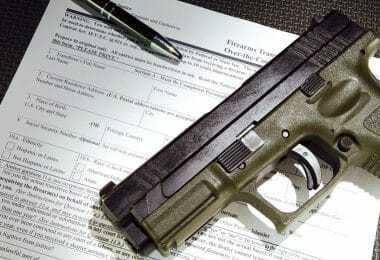 You’ll have 10 pockets at your disposal to carry everything you need, including callers or ammunition. And for a nice extra, this vest includes a decoy to improve your chances of putting a turkey on that Thanksgiving dinner table. Another useful perk is the added seat, that’s 3 inches thick, accounting for good insulation when you need a quick rest. You’ll find all the compartments of this vest allow you easy access with zippers. There’s a smaller pocket in front, and the main pocket includes some foam in which you’ll find some holes for the striker. Some other pockets and the pouch are made from elastic mesh, which is a sturdy, breathable material. The strap itself has a few elastic loops for carrying ammo, and you’ll also find enough room for carrying your decoys. The weaved cord on the back is another useful addition on the field. Description:This 4.6 stars and $49.99 Primos® B-Mobile™ Gobbler Decoy is a useful piece of equipment for every turkey hunter since you can easily lure in a turkey. The effectiveness of this decoy stems from the quality materials used for its manufacturing, which bears the mark of the reputable Primos brand. Besides, the product itself has been tested enough to ascertain the promise of it withstanding the elements and many of the possible on-field damage. Consequently, this gobbler decoy can be confidently used by all hunters, starting from newbies and ending with experts. That’s because it’s easy to use and to assemble: you just need to take it out of your backpack, set it up, and the turkeys will be instantly attracted to it. The veracity of this particular decoy can be explained by the fact that it has a built-in fan holder to make the feathers in the tail move very realistically. Besides, the slotted section can be used by hunters who want to add some real feathers. 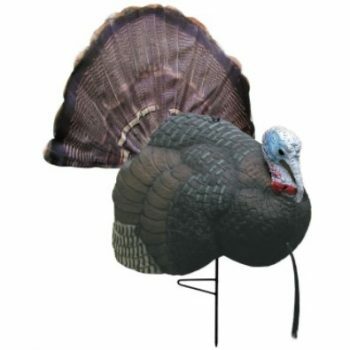 Plus, the flexible plastic and the metal stake gives it an erect look, making this decoy resemble an actual turkey. Although this item can be folded for increased portability, it can’t be made to fit your vest. However, it does come with a mesh bag with two straps to wear as a backpack. And more good news: this bag is voluminous enough to fit other pieces of gear too. Description: This 4.3 stars and $3.99 Flambeau Universal Turkey Stakes is just the thing you need for your decoy. That’s because it works with all decoys, and it has an advantageous retail price. You can use this stake on the field to replace a broken one or even one that’s still good but isn’t particularly tall. At just 0.8 ounces, you can easily carry it in your backpack, and its easy transport and storage are furthermore enhanced by a foldable design. As such, this stake’s ability to fold means it can also be unfolded quickly, which accounts for an easy setup on the field. Since its design is one-piece, you won’t have to bother with additional parts or a more difficult setup. Plus, you’re minimizing the noise as well. 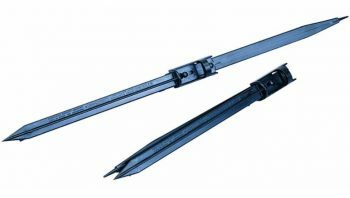 But since it’s built from only one piece, you can see how this stake is pretty resistant and less prone to being broken on the field. Since it reaches 24.5 inches total height, this stake is perfect for when you need additional visibility in high grass. That way, no turkey will miss your decoy and you’ll catch your game. 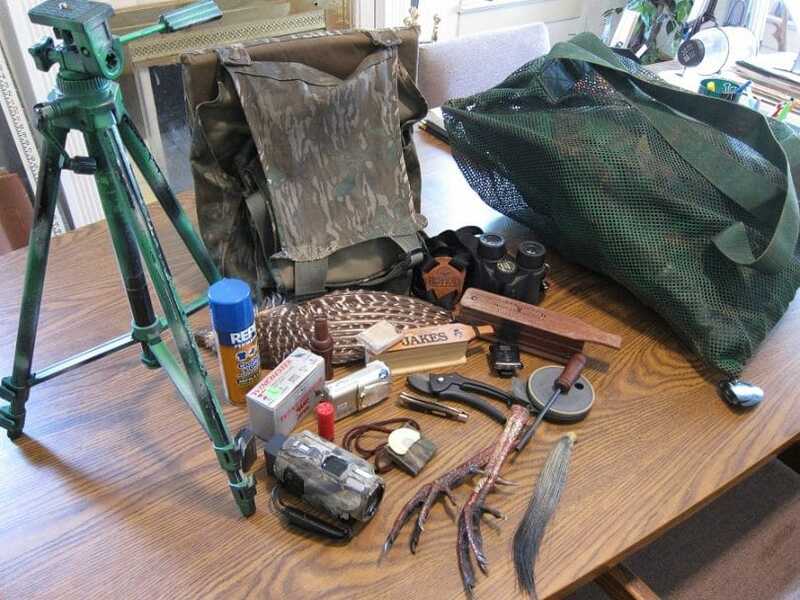 We’ve given you our perspective on things: how to choose your equipment for catching wild turkeys and which items are actually necessary on the field. We’ve tried to offer you a balanced array of products, that are versatile, durable and useful. However, you’re free to disagree with us if some of these items aren’t that useful to you, or if you found other equipment you absolutely can’t live without. But we’re not here to judge, we’re here to share our view on things with you. So let us know which gear actually works for you. 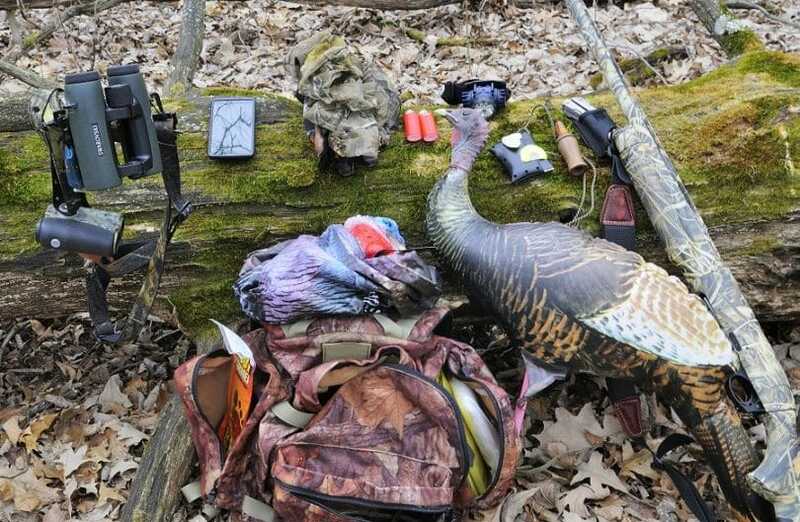 What’s the main item you wouldn’t go without on a turkey hunt? Except for your weapon, of course. And conversely, what’s the most useless piece of gear you’ve ever stumbled upon? 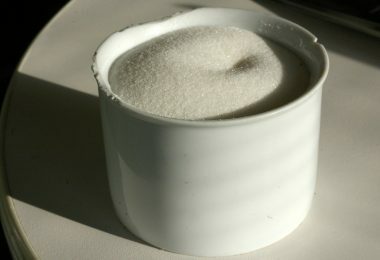 Have you tried similar items to the ones we’ve discussed above? What do you think in regards to their utility? We’re curious to find out much more about your turkey hunting experiences, the comments are right below! Best Compound Bow: What’s It All A-bow-t? How to Make A Hunting Bow: Easy Steps to Acquire New & Valuable Skills! 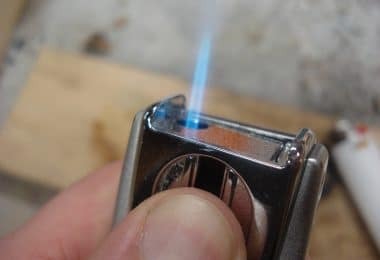 Best Survival Lighter: The Ultimate Savior for Those Times of Need!